Éclat Chocolate in West Chester has been featured in such high and mighty publications as Food & Wine, Vogue, and Philadelphia Magazine, so we here at Small Food figured it was high time to add our name to that list. We rolled into Éclat on a cold winter day, and were immediately greeted with a cheery offer for a free sample of “the best hot chocolate we will ever taste”. The unique aspect of Eclat’s hot chocolate is the way it is made — instead of using a powder, they use a chocolate lollipop type instrument (pictured above) to stir in the flavor to warm milk. Time for a quick lesson: Americans tend to use the terms “hot chocolate” and “hot cocoa” interchangeably, and by American standards this is an outstanding beverage. 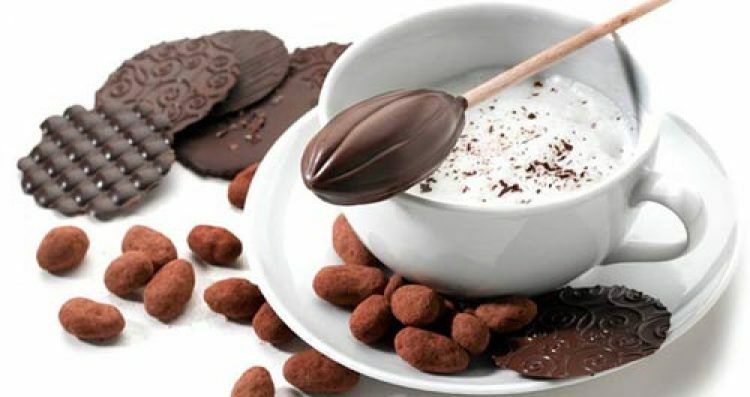 In Europe, however, while “hot cocoa” is the traditional beverage of chocolate powder stirred into milk, “hot chocolate” tends to be a much thicker drink that tastes almost as if you are drinking a melted chocolate bar. Clearly, Eclat’s version is closer to the Euro version, though it was not quite as rich or thick as those of the cafes in Central Europe. Even so, it is the best version one will find around here this winter. Next we tried the dark chocolate “bars”, which are actually mendiants, or thin discs of chocolate, mostly pure 60-75% chocolate, but sometimes with additional flavorings like pink peppercorns. Though tasty, these were a bit too thin, which created less of a smooth mouth-feel that I look for in fine dark chocolate. Considering the price — upwards of $15 for 5oz., I’ll stick to my regular chocolate bars. Lastly we sampled a few of the chocolates. Not expecting much (as per my comments above), I tried a dark chocolate caramel — and it was out-of-this-world outstanding! The rich, dark chocolate and the deep, buttery, toffee flavor are simply a perfect combination, and the explosion of flavor that comes from a few small sea salt crystals only builds on said perfection. This is certainly a must-have on any trip to Éclat. I tried a few of the weirder combos as well — the red wine truffle and the passion fruit chocolate were interesting, but nothing spectacular, and the beer truffle, made with Victory Prima Pils, was just plain odd. All in all, Éclat is an enjoyable place to go, with some excellent choices to match your taste. Order online at http://eclatchocolate.com/.